Super guitar builder Ron Kirn's templates are currently being posted at eBay by seller pierre302 in a series of "Buy It Now!" 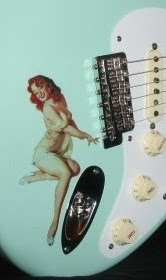 listings which include templates for Strats, Teles, Tele Thinlines, Tele Bass, J-Bass & P-Bass. The seller is Ron's son-in-law and can be verified as such at www.ronkirn.com home page, where these listings are mentioned. A great friend to the DIY home guitar builder, Kirn is known for providing plenty of tips and resources. Our February '09 profile on Ron features a beautiful shielding example from his Strat Build Tutorial. Premier Guitar's Jan '09 issue included Ron Kirn in their Tele Builder feature. If this is the first you've heard of Ron, check out the PG article.